Red currant bushes, loaded with bright red fruit power-packed with vitamins and minerals, are easily grown in the home garden. Tiny, tart currants are delicious in wines, pies, jams and jellies. Red currant bushes begin to grow very early in the spring, so the bushes should be planted in early autumn or in late winter, before spring growth begins. 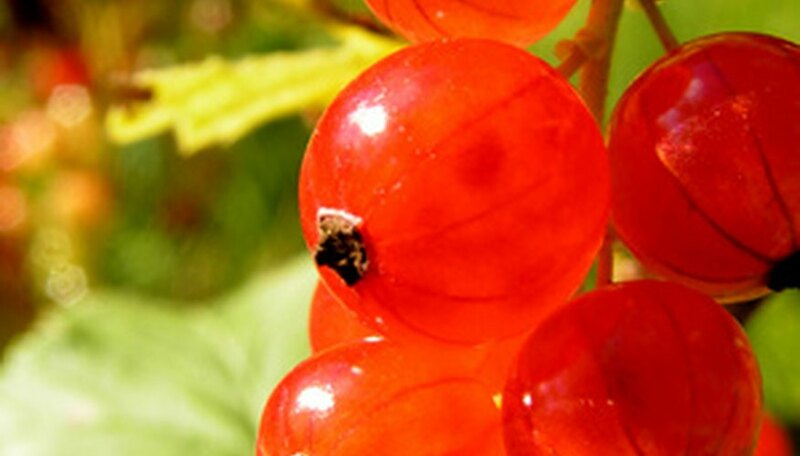 Red currant bushes usually produce fruit when the bushes are 2 to 3 years old. Choose a spot in your garden where the red currant bushes will be exposed to full daylight. The bushes should be protected from strong wind, which will result in smaller fruit. Cultivate the soil, using a tiller, hoe or shovel, to a depth of at least 12 inches. Spread 3 to 4 inches of compost or manure on top of the soil, and work it in thoroughly. Purchase a red currant bush from a reputable local nursery. Be sure the currant bush is locally grown, as a locally grown bush will be suited for your climate and growing conditions. Soak the red currant bush in a bucket of water for 24 hours before planting. Dig a hole just deep enough to accommodate the root ball of the red currant bush, and at least twice as wide. Place the bush in the hole with the roots evenly spread out, and fill the hole with the reserved soil. If you are planting more than one red currant bush, allow 4 to 6 feet between each bush. Spread 2 to 3 inches of mulch such as straw, compost, pine needles or shredded bark around the red currant bush. Replenish the mulch as it decomposes. Mulch will retain moisture, moderate the soil temperature and deter weeds. Feed the red currant bushes every spring, using 1/4 to 1/3 cup of balanced granular fertilizer. Apply the fertilizer according to the recommendations on the fertilizer package. Harvest red currants when the currants are deep red in color, and soft to the touch.